Since I had to quickly write the blog entry about the illegally posted tow-away signs in front of my house, I decided to spend this evening doing some further research about this matter. My late grandmother taught me to raise hell and advocate for what I believe in. She sure did that by demanding redress for all Japanese Americans forced into the Japanese internment camps during World War II, and after many years of working hard and being a leader, all survivors received a $20,000 check and an apology from the President of the United States. 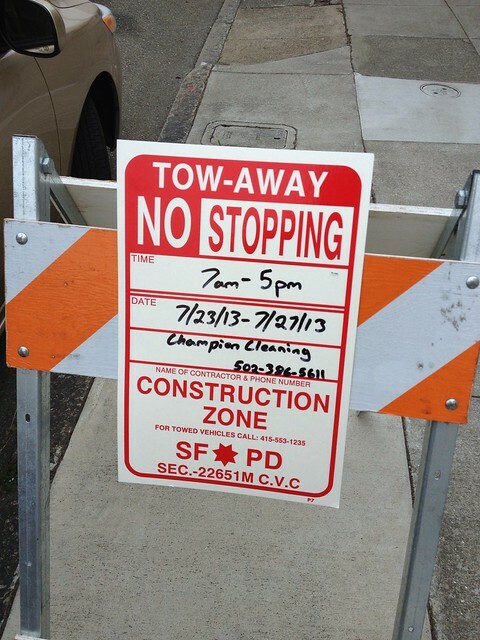 Now it's my time to raise hell against Champion Cleaning, the people who thinks it's totally okay to put tow-away signs and blatantly violate several laws in the process. I gave a call to SF 311 for an update about my complaint and was told the message was passed-on to the Department of Public Works' street use department, but didn't receive a response back. The next time I can get in contact would be as early as 8AM on Friday. I decided to call the SFPD Taraval Station and spoke with a desk sergeant. I explained the situation and he told me to get in touch with DPT (SFMTA Parking) about the matter. I asked if I had the right to file a police report for a company violating traffic code 33.1, and he said I can't. I also asked him if the station had a copy of any paperwork regarding any temporary tow away zones in their jurisdiction and he said they don't have materials about that; unlike what the officer at the SFPD Richmond station told me. Seeing no purpose of trying to call in circles, it was time to look around the city law books online. How far in advance should I apply for a tow-away zone permit? Tow-Away No Stopping signs must first be registered at least 72 hours in advance of the effective date and time. Once registered, the signs shall be posted at least 72 hours in advance of the effective date and time in order to give the public sufficient notice. Since the construction workers placed the signs LESS THAN 72 HOURS, it's illegal. If you recall, the construction workers placed the sign on Thursday, July 25th at 8AM; the posted sign said: 7AM-5PM and is effective from 7/23/13 to 7/27/13. The construction contractors should have placed the sign no later than 7AM on July 20, 2013; therefore it's a violation of numerous city laws. What do I need to know about posting tow-away zone signs? 1. Signs shall be posted only within the limits of construction. 2. Signs shall be posted every 20 linear feet of occupied space with at least one sign at each end of the occupied space. 3. Place signs on wood or aluminum backing or approved equal. 4. Mount the signs securely to existing poles, posts, on Type II barricades per Caltrans specifications, or on construction fences. 5. The Contractor shall maintain the signs on a continuous basis and shall replace damaged or missing signs daily. 6. Contractor shall remove the signs and mounting materials immediately after construction has been completed. Okay, let's do a little in depth about this one. They followed #1, #2, and #5 correctly. And the rest? #3 #4 is in violation because while they did post the signs on A-frames, they broke the law by posting some of them on traffic cones. #6 can't be determined until the project is done. "Building Construction, Maintenance or Repair. Any temporary Parking restriction or prohibition related to building construction, maintenance, or repair in the public right-of-way shall be posted in compliance with Article 15, Section 724.3 of the Public Works Code." This basically means the construction signage under the Transportation Code must comply with the Public Works Code or it is a violation of Section 3.4(b) of the Transportation Code. Let's go to Article 15, Section 724.3 of the Public Works Code. "The placard shall contain the following information: name of the permittee, a telephone number where the permittee can be reached during the hours of the permit, the duration of the permit including start and stop dates and hours of use, a geographic description of the street space occupied under the permit, the permit number, and the Department's street space hotline telephone number. The Department shall provide a placard to each permittee." Subsection (b) basically states the proper posting of signage, such as on a-frames and poles. They DID NOT provide 72 hours notice. DID NOT provide further information on the placards (items failed to mention: geographic description of street space occupied, permit number, and street space hotline number). POSTED SIGNAGE on non-approved items (traffic cones). Last stop: SFMTA's "Blue Book." Since so many of these construction zone parking laws cross between Public Works, Transportation Codes, and many others, the SFMTA published a "Blue Book" as an easier way for people to understand all laws and regulations. It basically sums up everything I've mentioned above. If you would like to read it, click here and review section 4. I've done my research, which means I have the ammo (the laws) to unleash hell. If the city officials don't want to do their job to enforce and place a $1,000 fine against Champion Cleaning (a subcontractor of PG&E), I'll start making the round of phone calls, starting with the supervisor of my district. If ANY CAR in my neighborhood gets either a ticket or towed in the next few days, I will fight back hard because you bastards NEVER gave minimum 72 hour notice.